Big design apartment Munda house - Hiša Munda is very conveniently located at the entrance to Ljubljana's Old Town. It is perfect for those who want to explore Ljubljana and Slovenia. Munda house features two big modern designer apartments. Apartment M1 with 5 bedrooms and apartment M2 with 4. Both are located on the elevated ground floor of a historical building. Both have been recently remodeled with the respect to the past. We love high ceilings and well preserved wooden intarsian parquet. We wanted it to be local, modern and at the same time global. Munda house is the place for real inquirers and people who enjoy life! Designing the Munda house, we had in mind a big family or a group of people getting together with a purpose to celebrate life and to discover Slovenia and Ljubljana in a relaxing way. Learning new things and seeing new places can and should be interesting and enjoyable! On this very spot used to be one of the first ever gymnasiums in Ljubljana. Gymnastic artifacts, like old ladders, rings, a pommel horse, the big inspiring picture of a group formation with gymnasts- radiating team spirit, or the vintage gym will take us to the past but at the same time allow us to feel the modern times. The spaciousness provokes good ideas, inspires friendly talks and a lively atmosphere. Local craftsmen were given the opportunities to be more than “just global”. In Munda house you will see Slovenian products, where ever possible. We wanted the living room to be unique, to give you enough reasons to feel the adventure starts here. It is a place for curious and open-minded people. In the big group friendly apartment Munda house 1 there are 5 bedrooms. One master bedroom is for two people, the other rooms can cater for up to four people. Altogether 15 + beds. In the big family-friendly apartment Munda house 2 there are 4 bedrooms. One master bedroom is for two people, two rooms can cater for up to four people and two more people can sleep in one adjacent room. Altogether 12 + beds. The ceilings are high and well-preserved wooden intarsian parquet lines the floor, typical for historical buildings of that times. In each room there's a large double window with blinds and curtains. The high-quality beds are custom made of solid wood. The materials used are all natural; cotton mattresses, cotton duvets and pillows and sateen cotton linens. Each bed is equipped with a powerful reading light, power socket and a box for personal belongings like glasses, phones and watches. Sitting upright on the lower bed of the bunk beds is comfortable. The upper beds are easily accessible by wide ladders. Not only the children love them! The names of the rooms in the 5-bedroomed apartment are the places in Slovenia we most want you to see. They are all about one-hour's drive away from Ljubljana and make excellent one-day trips. The kitchen in retro style connects modern times with the past. A washing machine and tumble dryer are included. The sliding doors on the kitchen cabinets intentionally show more than they hide to enable you to find the necessary utensils. It isn’t just the essentials that you will always find here. Maybe you will like the hand-picked dinnerware too. The “wafer” effecting edge of the wooden cabinets helps to connect the retro mint and pear colours. Another interesting addition is the porthole on the lower door, which brings a sense of playfulness and even the perception of cute. In the kitchen there are designer award winning Slovenian appliances. In the designer bathrooms, there are two showers, two and three toilets (in M1) and four washbasins. They are made out of decor cement. The bright colors will cheer you up in the morning! We hope you will like the figurines on the shower doors. They are taken from the first Handbook on Gymnastics. In the section Read more about the interior design a detailed description of the materials used can be found. The facade of the main entrance to the historical building from Rimska cesta 8 is under the cultural protection. The portal is decorated with the letter M, the initial of the founder, Dr. Franc Munda, who had this house built after the Ljubljana earthquake in 1895. The vitrage in the house hall is simple but beautiful. The entrance to Hiša Munda – Munda House on the left through the white doors is under cultural protection as well. The doors are placed in the middle of ten stairs, made out of Karst stone. Research in Ljubljana City archives revealed that the main hall had been deepened and the four lower steps were added later. The entrance to the apartment has remained since on the fourth step. 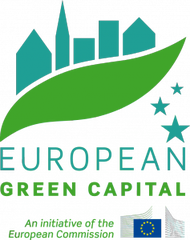 home to over 280,000 inhabitant is European green capital 2016.